Jan will be spotlighted in a new concert series entitled Kind of Jazz for three concerts at the prestigious Stockholm Concert Hall: first on 11.01.19 in a Tribute to Duke and Oscar, then on 08.02.19 in a duo with trombonist Nils Landgren, and finally on 08.03.19 with his own trio and Musica Vitae, one of the most famous chamber ensembles in Scandinavia. Jan will be on a short promotional tour in South Africa from oct 3 to 10 with a special trio supported by two renown South African musicians. Three concerts in Cape Town, Durban and Johannesburg have been confirmed plus a private event at the Swedish Embassy in Pretoria. This year's tour will prepare a longer one scheduled for autumn 2018 with one of Jan's current projects. COPENHAGEN, Dec 1st, 2016: Copenhagen’s historic jazz club Montmartre has hired the Swedish top pianist and head of Ystad Jazz Festival, Jan Lundgren, as its new artistic director. Montmartre’s future existence has been hanging in the balance since the City Council of Copenhagen announced in September that it would end its annual support for the club in a cost savings round. However, the club’s board has managed to put together a rescue plan based on contributions from private donors, foundations and by teaming up with a succesful Copenhagen restaurateur Rasmus Bo Bojesen, who will open a lunch restaurant and cafe in the club also outside concert hours and contribute financially to the club. "We have crafted a temporary rescue plan for a periode while we are talking and negoriating with a number of parties about a long term solution for the club", said Michael Christiansen, the chairman of the board. "I’m honoured and humbled by this task. Montmartre has a proud reputation as one of the finest clubs in Europe and was home to some of the greatest names in jazz for several decades like Dexter Gordon and Ben Webster. I have big ambitions for how to take Montmartre forward into the future", said Jan Lundgren. As part of the rescue plan the club will host a new restaurant and cafe outside concert hours headed by the successful Copenhagen restaurateur Rasmus Bo Bojesen. "We aim to create one of the most cosy and informal eateries in central Copenhagen with jazz on the record player and a good vibe", said Rasmus Bo Bojesen. He’s been heading the restaurant in the Copenhagen Opera for many years and recently also launched a successful restaurant in the tower of the Danish parliament, “Tårnet". Jan's recently released Tribute to Jan Johansson album on ACT entered into the Top Jazz 5 of Messo TV. Voting is still open! Officially released on april 29 on the German ACT label, Jan's new album was already nominated Jazz Album of the week by the NDR jazz department in Hamburg. Only released in the very last days of february Mare Nostrum 2 immediately climbed to position n°2 of the German jazz charts in march and the album gets enthusiastic reviews all over Europe. Today is the official release in Europe of the second Mare Nostrum album on the German ACT label. Great news: it became immediately no 1 of the iTunes jazz album charts ! Jan's new ACT album The Ystad Concert / A Tribute to Jan Johansson - already released in Sweden - has immediately reached the top position of the jazz charts. After the big success of the completely sold out release concert at the Konserthuset Stockholm the first press reviews are enthusiastic-"---Jan Lundgren allows Jan Johansson's legacy to shine naturally and organically..." (Alexander Agrell, Sydsvenskan). We can now announce the first series of confirmed concerts related to the release of Mare Nostrum 2: Rouen (FR), 31.03.16, Cully (CH), 12.04.16, Pisa (IT), 26.04.16, Basel (CH), 03.05.16, Essen (DE), 26.01.17 and Zurich (CH), 12.05.17. A lot more shows will be communicated soon including festivals and important classical concert halls. So please stay connected to Jan's official website. Jan's next ACT album is already in the pipeline: The Ystad Concert / A Tribute to Jan Johansson will be released on april 29, 2016. Recorded live at the 2015 Ystad Sweden Jazz Festival, the new release breathes new and unfamiliar life into folk music classics by Swedish jazz legend Jan Johansson, performed with a string quartet. The long wait is over. Mare Nostrum 2 marks the return to the studio of a European supergroup - and they're on top form ! Release date for Germany is 26.02.16. First confirmed shows will be published in early january 2016. On september 25 Jan's new quartet with Jukka Perko (alto sax), Dan Berglund (bass) and Morten Lund (drums) will have its live premiere at the RWE Pavillon of the Philharmonie Essen (Germany). Already sold out since a couple of weeks, the entire concert will be filmed in HD quality and a videoclip of the show will be produced. The release of the album is still planned for early autumn 2016 on ACT. Jan's prestigious Mare Nostrum project together with Paolo Fresu (trumpet, fluegelhorn) and Richard Galliano (accordion, accordina) celebrates it's 10th anniversary. This week the master of Mare Nostrum 2 (recorded in february 2014 in Studio La Buissonne) will be delivered. The album will be released on ACT at the end of march 2016. We will soon be able to announce the first confirmed concerts of the trio in several European countries. The Friends of Jan Lundgren, Jan's fan club, has just published issue 3 of JLN (Jan Lundgren News). This latest edition of the newsletter follows Jan as he gets ready to perform at a concert and, among several other stories, discusses the important role that teaching still plays for Jan. To look at or download JLNs 1, 2 and 3, go to http://friendsofjanlundgren.com/newsletter/. In early may 2015 Jan will record in the renown Hansa Studio (Berlin) his first album as part of his second ACT debut. The partners in his new quartet are Jukka Perko (alto sax, Finland), Dan Berglund (double bass, Sweden) and Morten Lund (drums, Denmark). JLT will be on tour in Russia soon and perform at the prestigious Tchaikovsky Concert Hall in Moscow as part of the Only Jazz concert series (november 11) and at the Philharmonic Hall in Abakan (november 13). After Ystad, Jarasum and Lustenau this will be his third meeting with the fantastic harmonica player Gregoire Maret. Jan greets his fans in South Korea in attendance of his concert at the Jarasum international Jazz Festival for a concert scheduled on october 4. He will perform at 4:30pm on the Jazz Island stage together with bassist Mattias Svensson and drummer Magnus Öström. As a special guest harmonicist Gregoire Maret will join the band. 26.09.14 - JLT back in Korea ! After five years Jan Lundgren Trio will be back at the 11th Jarasum Int'l Jazz Festival for an exclusive concert on the main festival stage together with special guest Gregoire Maret on harmonica. Jan has been awarded with another prestigious prize for his efforts in bringing world class jazz musicians together in the Skåne region in southern Sweden. The 5th Ystad Jazz Festival will soon take place with renowned musicians from around the world and will be covered by a number of impressive journalists. Jan Lundgren, artistic director, will perform on 2nd and 3rd August 2014. JLT will perform a unique concert at the renowned Duc des Lombards jazz club in Paris on June 16. The day after, on June 17, he will appear live as a guest on the Un mardi idéal ('A Perfect Tuesday') programme (2230 to 2400 CET) of France Musique , part of the Radio France group. Visit the show's web page for details: Un mardi idéal . You can listen to the broadcast on the radio, the internet or as a podcast. 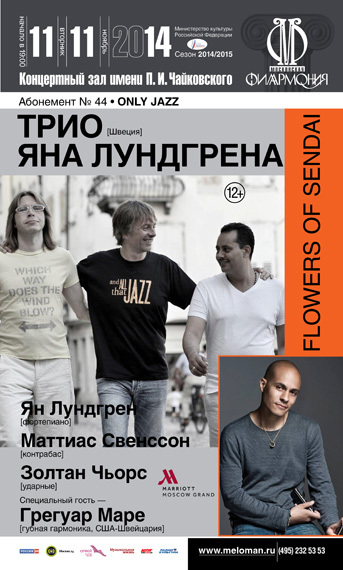 The tune Transcendence (composed by bassist Mattias Svensson) from the new trio album Flowers of Sendai has been selected for the L'Esprit Jazz playlist on the worldwide Air France flights in July/august 2014. Recorded, mixed and mastered at Stefano Amerio's renown Artesuono Studio, the new trio album is released on april 24 on the French Beejazz label. JLT will perform in Berlin and in Paris soon, be on an extensive Japan tour in september and finally tour Europe in october and november. At some shows the trio will be accompanied by special guest Gregoire Maret on harmonica. Watch out the concert schedule on Jan's officlal website. Jan makes it on the cover of the renown JJ magazine in England!